Guess what? After a couple years of inactivity, I'm firing up Youtube channel and blog again! I've finally been able to settle down in a place with my own workshop and will be working towards creating more content, beginning with a regular 'Code With Me' series. In the first video I take you through the 'Beautiful Strings' challenge from Code Eval. Why a coding video series? Many people develop software in c++ and many people want to learn how to write good c++ code. One of the best ways that I've found to learn how to write good software is to work with other experienced developers. Each person usually brings new insights and strategies. Hopefully, by giving you the opportunity to look over my shoulder and watch me solve problems, you will pick up some new knowledge and hopefully even comment if you have insight of your own to add. Feel free to engage and ask questions! A couple years ago I began looking at the experimental support of some of the newer C++11 features. At the time, compilers only offered subsets of the functionality. My first exposure was the 'auto' keyword. I didn't like. I want a strongly typed language when I use C++. `auto` seemed so lazy and sooo un-explicit. After listening to several cppcon talks on youtube, including one by Herb Sutter, I realized that auto can be a useful tool when used appropriately. My experience with `auto` illustrates one of the major barriers for established C++ developers using newer C++ features. I don't know if you know this, but C++ has been around for a long time. And by long time, I mean it is ancient as far as languages are concerned. Sure, it is newer than Fortran and COBOL, but at the rate at which programming languages have exploded, C++ is a grandparent with many grandchildren. 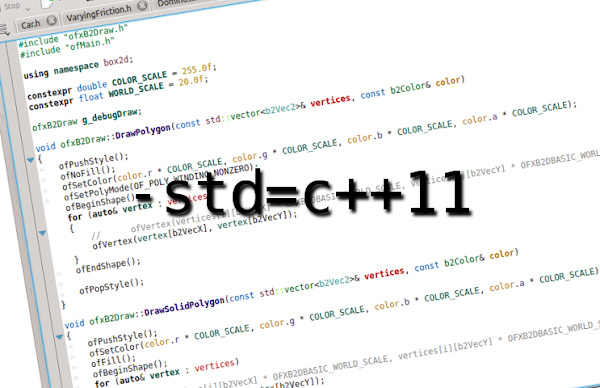 Many senior developers have spent their entire careers developing in C++ with minimal change. Sure, they lived through the wild west of the STL. Sometimes they had to use assembly when C++ just wasn't giving them the performance they needed. C++ finally provided a language that was good enough to solve most programming problems. C++ accumulated significant technical debt when compared to other more modern languages. As such, when it came time, releasing a new standard took a long time and had snowballed into a huge feature set. Fast forward to today. Several compilers actually comply to the full standard today, and will comply to future standards within months of new standards being released. How amazing is that? That means that you can use these awesome features without worrying about library compatibility or linking in 3rd party libraries. Plus, the built in features mean more cross platform compatible primitives. That... is huge. In the following posts I will go through some of the new features and actually talk about real world situations where these features will improve your code.